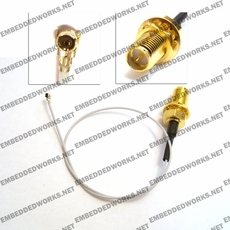 This RF Cable Assembly is commonly used for WLAN (WiFi) radio modules which require the Hirose IPEX-MHF3/ W.FL connector. Reverse-polarity SMA on one end. This assembly uses the .81mm RF coax cable, which has approx. 1 dB per foot loss at 2.4Ghz. The RP-SMA-female bulkhead connector has a center pin, and has a backing nut for bulkhead installations. The IPEX-MHF3/ W.FL connector is approx 1.5mm diameter, and offers a mated-height of 1.4mm, making it one of the most compact connectors for RF applications. Additional lengths are available in 100mm increments.